Hello! 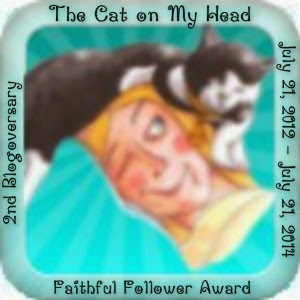 I'm Sharla and along with my two cats, Angel and Isabella, we welcome you to our blog! We hope you enjoy your visit and come back often! In addition to this blog, I'm using my love of creating beaded jewelry for my shop on Etsy to benefit my love for animals. Each of my designs are one of a kind and most of them contain an animal theme from paw toggles to cat face beads or animal awareness ribbon charms or butterflies. I also welcome custom requests. My items come from a smoke free, pet friendly environment. I support animal organizations who help special needs animals such as senior pets or those with a disability. I also support those who do TNR (trap, neuter, return) for feral cats to reduce the homeless kitties without euthanization. I have had pets literally all my life and currently my husband and I have two cats, Isabella and Angel, that we adopted from the humane society in 2006. 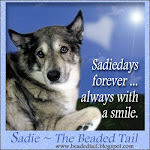 We lost our Husky named Sadie to cancer in June 2012 at age 11 1/2. She was rescued from a puppy mill when she was just 4 weeks old and we adopted her at 8 weeks. Our animals are a huge part of our lives and now live like royalty! In addition to our current pets, we've had many wonderful pets that we've adopted from the humane society or had found abandoned so we certainly know that there is a great need for animal awareness education to prevent overpopulation, abused and homeless animals. I'm grateful to be able to sell my jewelry on Etsy in order to benefit animals. We're making tails wag one bead at a time!